Through the assistance of the Rotary Club of Northwest Ohio USA, Sunrise Rotary Club in Belize, and Medical Equipment & Supplies Abroad (MESA), the Rotary Club of Ambergris Caye Belize (RCACB) generously donated much-needed medical supplies to the Dr. Otto Rodriguez San Pedro Polyclinic II on Thursday, May 25th. President Dee Regis explained the donation process. 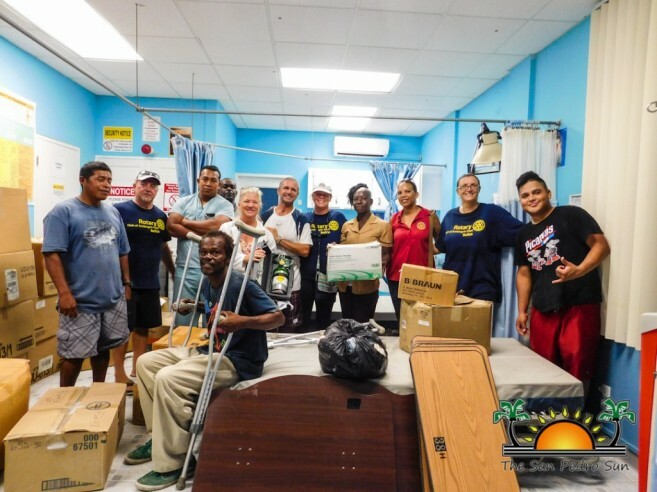 “The Rotary Club in Ohio consistently donates medical equipment to the Sunrise Rotary Club, who in turn donate to many facilities around Belize. The Sunrise Rotary Club took the wish lists from the 10 organizations, and assigned what was most needed to each facility. As we are a new Club, we were able to be included in this generous gift this year,” said Regis. On Wednesday, May 24th, RCACB members travelled to Belize City to receive their donation, and made arrangements for it to be barged over the next day. By 8:30 AM on May 25th, the Polyclinic received three new electric hospital beds, two manual beds, six mattresses, a medical storage cabinet with additional supplies inside, an exam table, a wheelchair, a couple sets of crutches, medical gowns, bed covers, blankets, safety infusion systems and lots of extra supplies. On hand to receive the donation was Dr. Javier Canul and Dr. Renae Sersland, who both expressed much gratitude to the Club. “This donation will assist the Polyclinic in rendering better care to our patients. I am very grateful,” said Canul. Sersland emotionally told the Club how the donations will be put into good use. “It’s wonderful because we need these items. We really survive off of donations. Things are a bit difficult right now, so receiving this relieves a lot of pressure. These items help us to be more effective in our work and help serve the people,” she said. As the Polyclinic began inventorying the donations, Regis explained that Rotary works closely with foundations who are able to provide medical equipment donations, maintenance, servicing, and training. She told The San Pedro Sun that she, along with RCACB, are grateful that there are organizations such as Rotary International, helping to provide service to the community. She also hopes to continue assisting and providing support to the Polyclinic, as well as to all the First Responders on the island. The RCACB thanks the Sunrise Rotary Club for the donation; Caribbean Depot for donating the cost of shipping and safely transporting the equipment from Belize City to San Pedro Town; Tropic Air for transporting RCACB club members to Belize City; Jodie Harnish for establishing RCACB’s relationship with the Polyclinic; and all of the volunteers who offered their assistance. The Rotary Club of Ambergris Caye Belize stated that its members will always remain committed to serve the community. To find out how you can become involved, please contact 653-4806 or follow them on Facebook: Rotaryclubofambergriscaye.